The demand for tablets is growing for more reasons than one that ranges from replacing the smartphones in shopping or the old fashion menu cards in restaurants. From being a simple device whose role was restricted to just being a reading device, it has suddenly been discovered to have more interesting roles. Akin to a desired eve that has an evergrowing bee-line of suitors, the list of its applications is just growing even though it is a far cry in terms of affordability (only 9 percent of people own it). The ecstasy is evident as suddenly the device is going places. Let’s see, what brought in the sudden change in the habits of people to own this piece of luxury. Larger Screen: If asked to make a choice between a smart phone and a tablet, consumers will use the latter to surf the net, click on links and type in the critical bio-data to purchase something online, especially since PayPal Express doesn’t seem to be integrated onto most mobile commerce yet. The portability: Consumers have the convenience of taking it around the house, airports and restaurants etc. Rich content: Engaging, innovative and unique applications are pompous contents. Moreover, page flipping, horizontal scroll, gyroscope and audio recognition give a unique experience. Restaurants such as Koh at Mumbai’s Inter Continental, Escobar and Royal China and Setz in Delhi offers diners digital menus on tablet PCs like Apple iPads. The menu, mostly offered as an app on the tablet PC, gives the diner a visual tour of the dishes with pictures, wine pairings and snippets about the ingredients, which enhances customer experience while whetting their appetites to surrender to the temptation of the alluring propositions on the screen. I got a chance to speak to MD Jain, MD of Lacs, that manufactures iPads, who did agree that tablet has become a fancy device of the new generation although he refuted the fact that smartphones will get replaced by them (even though the buzz is strong that they are taking over the smartphones), because of two main reasons: Firstly, it cannot replace voice, so unless the communication world shifts to business through exchange of data, it will always reign over the latter. Secondly, it is larger than the compact phones so there is a problem of portability. “Albeit, its demand is slowly growing, it will not be that big to replace the smartphones”, he concluded. The top players currently are Apple, Olive pad, Binatone, Infibeam Pi2, Accor, Samsumg etc. The estimated sales are at 8000 units per month, but that will only pick up when hardware prices fall and so does the data plans. Hardware prices have a wide range right now. The cheapest can go for Rs. 8000 (check out on Ebay, you may get it even lower) and the most expensive one can run up to Rs. 40,000. The data plans have to settle to that level playing field. With new sectors suddenly finding new applications and acceptability in sectors where there were no possibilities hitherto, the market of tablet will certainly grow. Its successful usage in the F & B Industry is an indication that it can help accelerate the industry if taken seriously, over a short time. Imagine, with the eating industry at 60,000 crores, it suddenly seems a hot proposition! 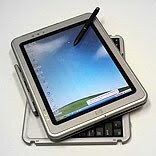 So, tablet manufacturers and dealers here is a hot opportunity, grab the tenders fast!!!!!!! !